Sound quality suffers at loud volumes, no effects loop return/send. Great value, will suit home musicians perfectly. have a love hate relationship with multi-effects units. On one hand they offer amazing value for money and come equipped with seriously useful features (on top of all the effects) like loopers or DAW capabilities for recording. On the other hand, by cramming so much technology into a small unit, they often require a degree in astrophysics to operate. Given you can spend as little as $100 and well over $1000 on a multi-effects unit, it pays to look carefully, not only into what effects the unit offers, but how easy they are to use. I hope you find this review useful, if not for how the Zoom G3X stacks up, then just for what considerations you should make when purchasing a budget multi-effects unit. It’s worth noting that Vernon Reid has a G3X in his stage rig which he uses for auto-wah, so that’s a big stamp of approval from a professional musician. The Zoom G3X is a small but powerful effects unit, that fits into the middle of the Zoom range of multi-effect boards. 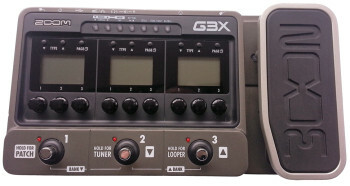 The G3X differs from the G3 in that there is a built in expression pedal, whereas the G3 requires buyers to purchase a separate expression pedal if they wanted that type of control. The expression pedal on the Zoom G3X does not have the bi-directional movement that the G5 offers, it’s a standard pedal. This is a really solidly built device. It’s metal construction and rubberised foot pad are high quality and make you feel like you’ve bought something high spec. I really can’t see any issues here with durability, though Zoom are a well respected brand so that’s no surprise. The stomp buttons are heavy duty and the other dials and controls all feel solid and not plasticky at all. All inputs and outputs are also sturdy, ie when you’re pulling and pushing cables in and out, there is no sign of poor construction. So a big thumbs up on build quality. Along with the build quality comes a really nice and simple design. As you get used to using the navigation system, you realise that the way all the buttons and dials correspond to the little screens makes it easier to use than some other devices available. The labels are clear and bright, which helps when you can’t remember which button starts the looper and which starts the tuner. Obviously a major part of effects units are the tones themselves. Looking at the Zoom G3x, there are over 100 amp models and effects to choose from. I think it’s a great range of sounds, though I think I’m not alone in saying that most multi-effect users tend to hone in on a small group of amps and effects that they like. The thing is that those favourite tones will be different for everyone, so by including so many options, Zoom are catering to almost all tastes. My favourite amp models were the Fender Deluxe type cleans and the Marshall crunch and drive tones. As far as effects went, I liked a LOT of them. Multiple delays and reverbs were great, chorus options were excellent and graphic eq and compression are really useful. 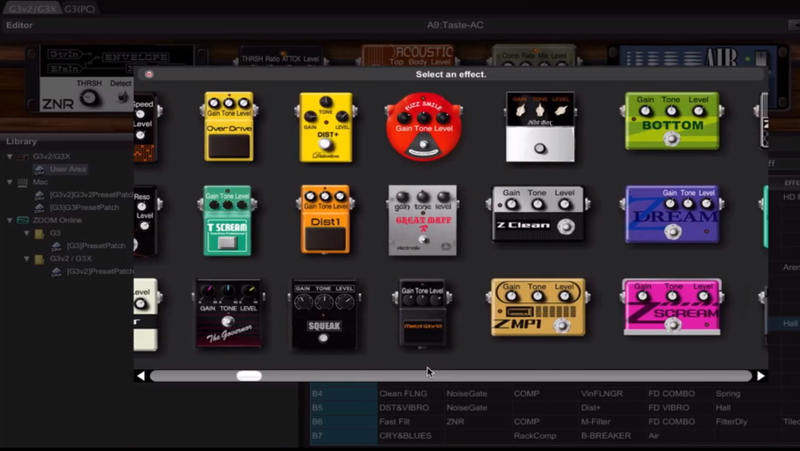 For a look at just how impressive the amp modelling sounds, check out this cool clip from Zoom. When it comes to tone quality, this is where it gets more difficult. For the home musician, particularly those who use headphones a lot, the Zoom G3X tones sound AMAZING. With a decent set of headphones plugged straight into the G3X, you can get phenomenal tones. Plug this into a DAW using USB and the quality is also surprisingly good. Where I find things start to fall down is when you’re through an amp, at high volumes. Here I found that the amp models, wah and gain effects suffered a bit. I think this is for a number of reasons. Firstly, unless your amp has an effects loop, the tone of the G3X is going to be altered by the pre-amp. Then even if you have an effects loop, the speaker and cabinet have an impact. What didn’t seem to be effected at louder volumes were modulation effects, things like delay, chorus, flanger, phaser. Reverbs also seemed unaffected by playing loud. So if you’re considering using the Zoom G3X for amp models, wah or gain…I would test it out in store to see what I mean. If you’re only planning on home use, I don’t think it’s a problem. I won’t bother listing all features here…you can just check the Zoom site, but here are the highlights. Drum machine with 40 patterns to choose from. Just pick a style and then dial in the tempo. Each of these bullet points could be expanded on significantly…such is the impressive feature set of this small grey box. I will step through a few of what I consider the best features, then we’ll talk about the important part – the tone. Before continuing, a quick intro to the concepts of multi-effects units and some vocabulary. If you’re familiar with these sorts of units, then you can skip this section. For example, you could select 6 effects – a delay, reverb, an amp model, distortion, wah and phaser. You set each effect to your liking and save that group as a “patch”. The Zoom G3X allows you to give the patch a name, like “Crunchy” and then decide which patch identifier to store it under. Patches are identified by a two digit code. The first digit is the “bank” and on the G3X you have A-J. The second digit is the patch number, and on the G3X you have 1-9. So patch identifiers look like A1, or D3, or H7 etc. The “Crunchy” patch you’ve made can be stored in any patch and recalled anytime. This basic system allows you to easily organise your effects and you can select them using the footswitches or buttons (or your mouse if you’re plugged into your computer). With patches from A0-J9 , that means there are 100 patches for you to store combinations of the effects and amp models you like. Now if you need more than that number of storable locations then I’d be amazed. It’s worth mentioning here that with all these patches of effects, you might think that it will get confusing where your favourite patches are. Edit & Share comes free and loads up whenever you plug your Zoom in using a standard USB cable. The simple interface lays out all your patches and you can drag them around, change them or restore previously saved patches that you filed away. I found that a good system was to put my favourite patches in the “A” bank, right at the start. Like my go to clean, crunch & gain tone…plus a few others. Then use Bank “B” for a variety of clean tones, “C” for crunch tones, “D” for Gain…then stored song or artist specific in other banks. It kept it nice and simple. Edit & Share makes it visual and easy to manage…it’s a nice simple product. The visuals of all the amp models and effects also makes it clearer what some of the emulated tones are. The Zoom community are constantly creating and sharing patches…just check out this site for a taste of what you can access. Simply download the patch and import it using Edit & Share. It’s dead easy. So if you can use 6 effects simultaneously, yet there are only 3 little screens…then how does that work? Well, good question, but the way Zoom have accomplished this is to simply have a scrolling concept by which the 3 screens show 3 effects in your currently selected patch. If you want to see the other 3 effects that are part of the patch, you can scroll from side to side. There are two ways to do this, with a small scroll button or by pressing two stomp buttons simultanesly with your foot. This is pretty awkward, and some Zoom modders have actually fitted a specific switch just for this which is awesome, though you’d need to be confident with electronics to attempt it. Check out this link for more info on G3 mods. Of the other main features, I think the looper and drum machine offer the home musician or even those jamming with friends with really fun options. The looper works easily and you can overdub multiple riffs. So you can overlay a few guitars if you like. It even has an “undo” in case you don’t like what you’ve overdubbed. I should note that with the “undo” option enabled, the looper is restricted to 20 seconds (which is still enough for practising song sections or even blues). In conjunction with the looper, the drum machine is really useful as well. There are plenty of beats to choose from and you can control tempo and volume. What I like most about the drum machine was that you can turn it on and leave it on while you arrange different tones or loops. Other effects units I’ve tried don’t let you navigate around, the drum beats and loops stop once you move away from that setting. The expression pedal can be used as a traditional wah, or you can assign the pedal to a part of an effect. For example, you can assign the wah to adjust the delay timing or gain level. You can even just assign the expression pedal to overall level, which means it can act as a bit of a kill switch. The “PRE” and “POST” switches allow you to control whether the signal is output per or post the G3 effects, when using the Balanced output. “PASSIVE” and “ACTIVE” sets the input impedance depending on your setup. There are more on these settings in the manual. A serious addition is the USB output to DAW. For those unfamiliar, a DAW is a Digital Audio Workstation. The industry standard term for a recording suite that allows you to record and manipulate audio tracks. To get a guitar signal (or any signal) into the DAW software, you need to use an audio interface. They take the signal from a standard guitar jack or XLR connector and transmit it to your computer using USB. The Zoom G3X has this capability built in, so you can plug your Zoom straight into your computer and the Zoom ASIO driver will allow you to record directly into any DAW (I used it with Ableton Live with zero issues). If you’re interested into getting into home recording, this is an extremely cheap way to do so – given most audio interfaces start around the $200 mark. The Zoom G3X has an impressive range of easy to access, practical features. I found the tones and effects to offer a huge range of options which are surprisingly easy to access from so few buttons and screens. The Edit & Share software is simple and makes managing patches a lot easier. At loud volumes, I found the amp modelling to suffer a little in terms of authenticity, though this wasn’t a problem for recording or headphone use. Stomp effects seemed to work fine at bedroom or loud volumes. For the same price that it costs to buy some individual effects, you really can’t go wrong with this unit. The Zoom G3X offers enormous value for money.